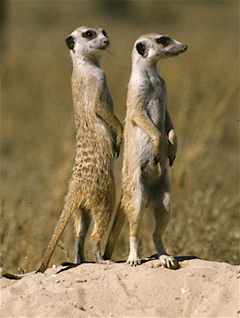 meerkat info from the home of the meerkats Fellow Earthlings' Wildlife Center, Inc. Fellow Earthlings' Wildlife Center was chosen by Animal Planet to partner with them on their hit series "Meerkat Manor." Director Pam Bennett-Wallberg was chosen to be Animal Planet's publicity spokesperson and is featured, along with our facility, on the Animal Planet's website. Jengo, the meerkat, gets "nose to nose" with his adoptive parent. Pam Bennett-Wallberg is married to the mob - a mob of meerkats, that is... Read the whole story. Founded in 1989, Fellow Earthlings' Wildlife Center is a 501(C)3 non-profit organization. 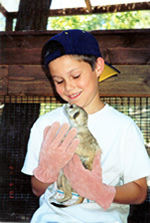 We are the only privately licensed facility that specializes in caring for meerkats (Suricata suricatta). Situated in the high desert of California, just 45 minutes from world-famous Palm Springs and 2½ hours from Los Angeles and San Diego, our location was carefully chosen for its climate, which most closely replicates that of the meerkats' native habitat in the Kalahari Desert of southern Africa. Surprisingly, meerkats are one of the most strictly regulated animals in the world. We hold licenses and permits from California Fish and Game, U.S.D.A., and Fish and Wildlife Service. The animals come to us from accredited zoos and are placed here for a variety of reasons: The meerkats may be orphaned, injured, old, sick, or the previous facility has simply run out of room and can no longer care for them. The meerkats that are placed with us are given life-long homes at Fellow Earthlings' Wildlife Center, Inc.
You and up to three of your guests can have a private, two-hour interactive experience with the meerkats through our Adopt a Meerkat Program. You can feed, photograph, and play with the meerkats at our Center. Our wee rascals will enjoy taking treats from your hand, sitting in your lap, untying your shoelaces, and peeking in your pockets.